p. 124 ‘Your daughter Margaret and her children’: Jean and Tytler had two daughters, twins, Helen and Margaret. There is no record of their birth, but the ages they gave at various times during their lives suggest that they were born around 1787. Both came to Salem with their parents. Margaret married Daniel Anderson on Janury 23rd, 1813 in Salem. They had five daughters, The youngest, Elizabeth Eaton Anderson was born 25 August, 1830, so she would be the littlest listener to Ben’s tale; the eldest, Helen Tytler Anderson was born in 1817 and would have been elsewhere (she was married in 1842 to William Phillips Cummings . The others, Sarah, Eustace and Lucy would have been eleven, ten and eight in 1833.
p. 125 Tytler published two descriptions of whaling, one in the EBII, under the entry Fisheries, and one, a shortened version, in his Universal Geographical Grammar (this one is online HERE). They constitute the fullest description of UK whaling from that era. The remarkable thing is that they are written from experience. 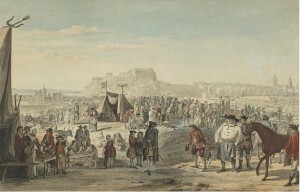 A the end of his first (and as it turned out, his only) year at Edinburgh University Tytler engaged as ship’s surgeon on The Royal Bounty, a whler out of Leith bound for Spitzbergen. Ben’s story is drwan from these two texts. p. 130 I have no information concerning how Tytler met Jean Aitkenhead. He was working in the dispensary in 1782 when they were married, and she was living in The Pleasance, so their paths may well have crossed. As will become clear, I have used the confused memory of an eighty-year-old woman to present a number of options of which a visit to the dispensary is probably the least likely. Thomas Aikenhead (c. March 1676 – 8 January 1697) was a Scottish student from Edinburgh, who was prosecuted and executed on a charge of blasphemy. He was the last person in Britain to be executed for blasphemy. His ‘indytment’ can be read HERE. 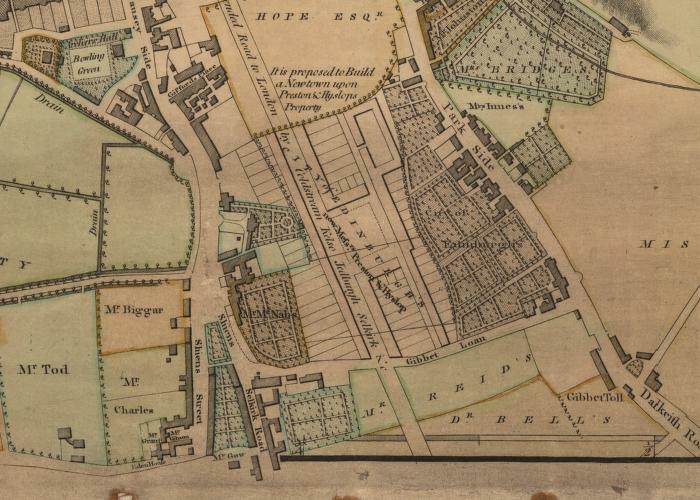 p. 133 ‘walks through parkland’; the land in question is what is now known as ‘The Meadows.’ It was then in the ownership of Thomas Hope, who had had it drained (it had once been the ‘Burgh Loch’ and the source of Edinburgh’s drinking water). Various maps of the period show the name ‘Gibbet Loan’ in slightly different places. Gibbet Toll, however, stood on the corner where the Commonwealth swimming Pool now is, on the path up towards Arthur’s Seat. The only tenement shown on these maps is that at the east end of what is now Preston Street, but which on some maps os indeed labelled ‘Gibbet Loan’. In 1778, the Earl of Seaforth, the chief of the Mackenzies, raised a regiment of about 1,000 men from his estates. So great a proportion of this number were Macraes that the regiment – officially named the 78th Seaforth Highlanders – became commonly known as the Macraes. 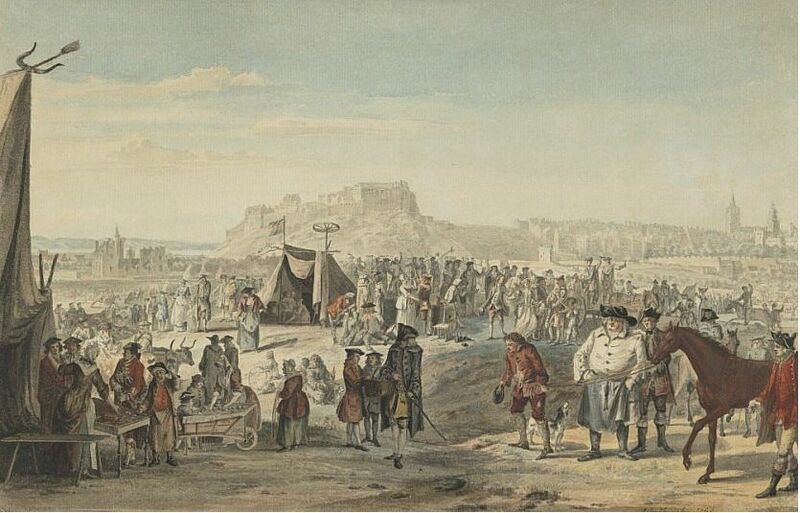 In June 1778, the newly levied regiment came to Edinburgh and were quartered in the castle and elsewhere in the city. In August, they were moved to Leith for embarkation to Guernsey. Most men had enlisted for no more than three years and there was a written condition attaching to their enlistment that they would not serve their time outside Britain. The rumour, though, was that the whole regiment was to be sold to the East India Company for service in the East Indies. The Highlanders sought reassurances from their officers, but the explanations they received were far from convincing. 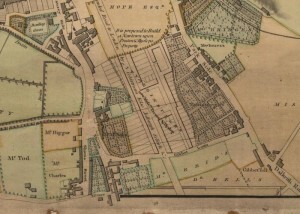 On Tuesday 22 September, the regiment were marched to Leith Links and ordered to board the boats assembled there. The rumblings of discontent spilled over and the men refused to obey. Some eventually did take to the boats, but some six hundred remained defiant. Fearing that other troops might be called against them, and after some hours of discussion, they then marched in regular order to Arthur’s Seat, with two plaids fixed on poles instead of colours and with the pipes playing at their head. Having ascended the former volcano, they took up position around the top of the crags and prepared to defend themselves against any assault, vowing to remain there until their just demands were satisfied or they were ejected by force of arms. The sensation this caused among the citizenry of Edinburgh was considerable. A large crowd had turned out to witness their march across the city, and many now proceeded to keep the mutineers supplied with provisions. The sympathies of the ordinary people of Edinburgh plainly sided with the Highlanders. The authorities, as can be imagined, did not view the mutiny in the same benevolent light. The senior generals of the army in Scotland immediately summoned more troops to Edinburgh and assembled a substantial force comprised of men of the 11th Dragoons, the Buccleugh Fencibles and the Glasgow Volunteers. Fortunately, the generals were disinclined to resort to force of arms and instead began negotiations. General Skene, the Earl of Dunmore and the Duke of Buccleugh were among those who visited the encampment over the next few days to conduct talks with the Macraes. To their credit, the Highlanders remained respectful and well disciplined throughout, but remained staunch in their demands: a pardon to all of their number for all past offences; that all levy money and arrears due to them should be paid before embarkation; and that they should not be sent to the East Indies. Whatever the deal arranged by the generals, the Regiment did eventually leave for the East indies in 1781; during the voyage 274 died and many suffered debilitating illnesses. Very few ever returned to Scotland. I have no other evidence that these entries were made by Jean’s mother, nor that she was in Edinburgh at this or any other time. p. 137 ‘The intent of matrimony…’; the article from which this is an excerpt was published in the G&LWM for June 29, 1774, under the title ‘Sentiments on Love and Marriage’. I am extremely grateful to Mr Greg Hughes [who is descended from William] for pointing me to this information; from it we have deduced that William was born in Leith in 1766, and was thus the oldest of Elizabeth Rattray’s contribution to the Tytler family. His life is surprisingly well documented in his military pension records, and will be discussed more fully at a later stage. p. 138 ‘about to be brought to bed with our Lizzie.’; again, for information about Lizzie, I am grateful to Greg Hughes. Her story is told later. 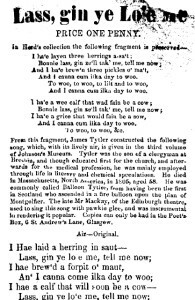 p. 139 ‘I consider soldiers in all ages…’; the article quoted is from the Weekly Mirror‘ for March 9, 1781.
p. 141 The sole source for tytler’s playing the bagpipes is Robert Anderson’s brief biography first published in Cromek’s Reliques of Robert Burns in 1808. This mention of Tytler’s piping by Anderson is presumably what lead to his inclusion in the notorious painting of the inauguration of Burns as poet-laureate, a matter which will be discussed later. The image of Lizzie dancing to his pipes is, of course, a fancy of my own. 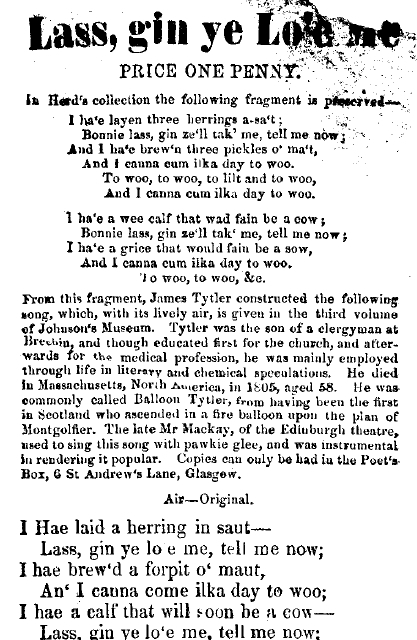 p. 141 ‘one or two of the songs Jamie wrote…’ Exactly how many of the songs in Johnson’s Scottish Musical Museum are Tytler’s work is unclear. It is interesting to note that those which are generally accepted to be his, are the worst of the bunch. p. 143-146 The Electro-Magnetico Celestial Bed: Graham’s story is outlined in the wikipedia page designated to him : HERE. The reference there to this page yields more information. p. 146 the story of Walter Scott’s encounter with Graham’s electrical contraptions is told in volume one of Sir Walter Scott The Great Unknown by Edgar Johnson, as remembered by John irving. (1970). The notion that a son of Tylter’s named George was friends with Scott, is possible, but ungrounded in any documentation of the life of the great man. p. 147 ‘The Bickerings’; once again I have placed Tytler’s (possible) son george in the context of Walter Scott’s boyhood. Scott tells the famous story of ‘Green Britches’ in his General Preface to the Waverley Novels; Robert Chambers found a reference in the Town Council records for 1529 to ‘Bykkerringis betwix Barnis’ : it was included in his essay on the Bickers in his Traditions of Edinburgh.